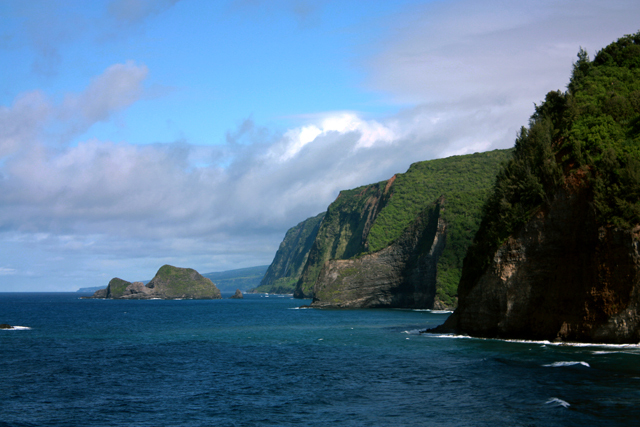 The North Kohala coast as viewed from Pololu Valley Beach on the big island of Hawai’i. Photo by Karyn Boenker. In Hawaii, it feels like summer all year long. Waking up on the islands brings promise of a mild temperatures, warm beaches, and fresh fruit. No matter the scenery, you cannot escape the surrounding Pacific Ocean. Locals joke that every home in Hawai’i has an ocean view. Every year, on the big island the Waimea Ocean Film Festival celebrates a bond between island residents and the sea. From January 3-11, 2013, the festival team will host their most promising event yet. Over 9 days, 40 films and an endless number of fabulous guest speakers will take over theatres and stages across the North Kohala coast of the big island. Everyone will be talking about the ocean and the human interaction with it through sport, food, and art. If you attend, do so guilt free because the environment was considered in every planning choice leading up to curtain call. “[The environment is] part of what I think about every day,” Tania Howard, Executive Director of the Waimea Ocean Film Festival, told Karyn Boenker. The festival will sell reusable canteens and provide filling stations for guests, rather than promoting the sale of water bottles. Even the press passes were printed with soy ink and made with cardboard instead of laminated paper. Not only is this more eco-friendly it is also beautiful. The passes are finished off with a local women hemp necklane and kukui nut fastener. The festival’s luxurious dinner event, Taste of the Island, features locally caught fish and farm-fresh food. Planners serve limited meat and focus on high quality local produce, which provides for a number of vegetarian options. Last but not least, available beers are all from local breweries. When a public event goes green there are monetary savings and local benefits to be reaped. Energy and supply costs go down when items are purchased locally. All profits from the Waimea Ocean Film Festival support participants, so prices are fair and amenities are plenty. On top of all that, local businesses will benefit from the added traffic. The Waimea Ocean Film Festival will support local communities by hosting the event in two locations over a couple of weeks. Both historical locations and world class hotels will host screenings. The festival truly displays how to go green with glorious style. “I think in the big picture most companies will find that there is economic benefit to reducing consumption and energy use,” Howard replied when asked about environmental incentives.